Donald Bryan has been pastor of the First Pentecostal Church since November 1982. Prior to being called pastor, Rev. 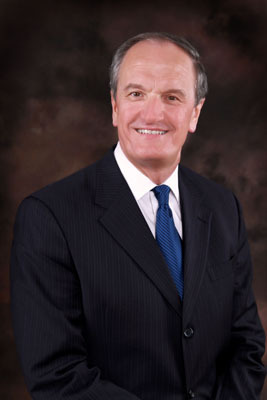 Bryan worked as a chemical engineer in Texas, having received his Bachelor of Science in Chemical Engineering in 1974 from Louisiana Tech University. He worked for Dupont Chemical Solutions in Orange, Texas until 1981. After a one year stint as associate pastor in Moss Bluff, Louisiana, God called him to be the pastor of the Slidell church in 1982. Pastor Bryan strives to serve the people of First Pentecostal Church and gives of himself to his church and community. To this end, he received his Master of Arts in counseling in 2008. Pastor Bryan is very involved in community, not only as a concerned citizen, but as an active minister. He has served as Rotary Club president, Rotary District Governor, as a member on the Governor’s Commission on Family and Marriage, as a member of the Slidell Ministerial Alliance, and is the Presbyter of the Greater New Orleans Section 12 of the United Pentecostal Church International. In addition, he is the Senior Chaplain for the St. Tammany Parish Corner’s Office and serves as editor of the Louisiana Challenger. He and his beautiful wife of 44 years, Debra, have two daughters, Stacy and Courtney, two sons-in-law. Brent and Greg, and three grandchildren, Carson, Aurora and Reagan. Pastor Bryan encourages each person he meets to reach their personal and spiritual growth goals and looks forward to welcoming you to the house of God. We at FPC have been tremendously blessed to call Rev. Bryan our pastor for over thirty years, and we look forward to many more years of serving God together.